The Patriotic war of 1812, or "Russian Campaign of Napoleon" occupies one of the most significant places in the century-old, dramatic history of Russia. 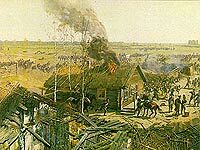 That war became the beginning of the end of the Napoleon Empire; Napoleon-s Grand Army was completely destroyed in Russia. Currently, Museum-Panorama "The Borodino Battle" is the only Moscow Museum with exposition telling about the military campaign of 1812. Panorama was opened on August 29, 1912, in Moscow and has become the focal point of the historic-memorial complex in the honour of the victory of the Russian people. Opened in 1995, new exposition of the Museum displays its exhibits in few sections. Besides the panoramic view of Borodino battle the visitors may also examine some more exponents devoted to the prehistory of Patriotic war, the course of the campaign of 1812, as well as the military events of 1813-1814. Panorama "The Borodino Battle" occupies the central place among the museum exponents. The canvas is 115 metres long and 15 metres high. The painter - F. Rubo - decided to show the decisive moment of the battle - half past twelve of September 7, 1812. The Museum is equipped by modern means, including sound effects, etc. The visitors may listen to recorded guide in English, French, German. Open hours: 10.00-18.00 except Friday.